Make (something) more attractive by the addition of decorative details or features: "blue silk embellished with golden embroidery". Make (a statement or story) more interesting or entertaining by adding extra details, esp. ones that are not true. As per usual, I couldn't help but peruse through Vogue.com, and I must say, it's grown into quite an addiction. 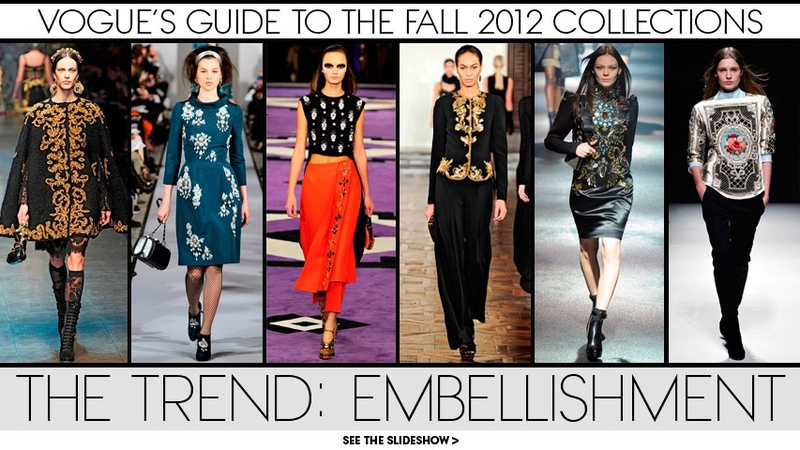 Looking through Vogue's Fall Guide 2012, I stumbled upon The Trend: EMBELLISHMENT. For those of you that know me personally, my middle name is "embellishment". There is nothing more quite beautiful to me than embellishing an outfit. I know Vogue says it is a Fall trend, but hey why not start using it now? Embellishments are fun, quirky, and make others take a second look! Embellishing an outfit whether it be adding some fun arm-candy or a glamourous scarf, a glitzy ring, an eye-catching bag, or even embroidery on a favorite piece of yours, is sure to complete your look. The looks seen on the runways are showing lush materials, faded gold brocade work, stand-out ornate designs, deep rich colors, vivid glitzy patterns as examples of the 'embellishment trend' on clothes. This shopping season, keep an eye out for looks that emphasize a bit of glitz and shimmer. Always keep a go-to embellishment piece around, you never know when you'll need it to up-the-ante on an outfit. Cute! I'm so into this kind of thing right now too! I am on the hunt for some cute tribal sequined skirts/shorts. I'm eyeing some from Express & Topshop at the moment! Good eye!